Tired of take out? Are you sick of standing in front of the microwave waiting for your five-minute ready to eat frozen dinner to finish cooking? It’s time to recycle those take out menus, unplug your microwave, and make a reservation at a bed and breakfast for a cooking class with trained chefs. You can whip up savory and sweet dishes on this culinary getaway, then unwind after a day spent seasoning, basting, kneading, and tasting. 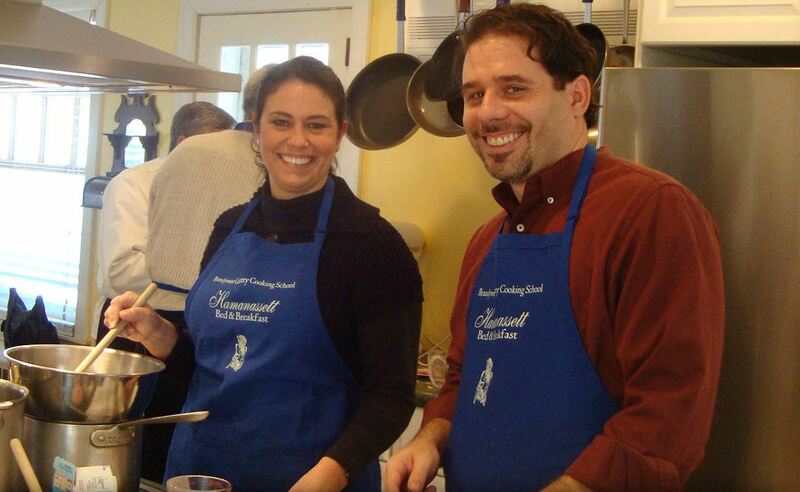 Put on your chefs hat and get ready for a gastronomic experience at Hamanassett Bed & Breakfast in Chester Heights, PA. Brandywine Country Cooking School allows guests to take part in hands-on theme cooking classes such as “French Country Cooking,” “Mi Amore—That’s Italian,” and “Last Dinner on the Titanic.” Enjoy two nights’ stay in rooms that boast a king bed with canopy, 10-foot-high ceilings, and a comfy window seat overlooking a tranquil meadow. A breakfast of waffles with bourbon pecan maple syrup or eggs roulade with spinach and sundried tomatoes served in the elegant dining room with floor-to-ceiling curved French doors is the perfect way to start your day. At the end of this cooking getaway, take home some cooking tips and techniques, recipes, a keepsake apron and tote bag, as well as valuable feedback. After all, a meal prepared by you will be served and taste tested by your cook mates at dinner! 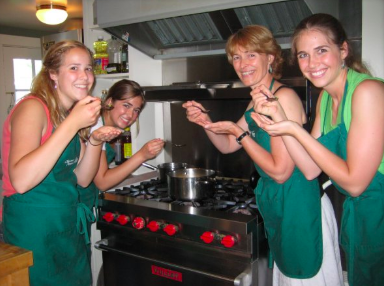 Taste the diverse flavors in foods such as Chicken Mole with Rice, Tagine of Chicken with Apricots, Potato Leek Soup, and Cucumber Raita when you don an apron for a cooking class at Chestnut Street Inn, Sheffield, IL. Explore the world’s varied and mouthwatering cuisines in hands-on cooking classes Sunday through Thursdays. Participants learn about spices, seasonal ingredients, and techniques from Chef Monika who will make you feel more comfortable in the kitchen. Guests at this historic 1854 home will also experience comfort and elegance in the expansive gardens, inviting patio, cozy fireplace, and soothing décor. This award-winning culinary focused bed and breakfast is the perfect getaway for foodies with palates that desire creative, worldly, and fantastic food. Bon Appétit! Does the idea of facing your oven to cook a meal terrify you? Can’t seem to expand your cooking repertoire? You won’t want to hide from entering your kitchen after you have spent time at The Hidden Kitchen at The Inn at Weathersfield in Perkinsville, Vermont. This cooking classroom, a former hayloft, welcomes students into class to learn, explore, and eat delicious foods together. Sign up for the June 18 Indian Street Food & Appetizers class (cabbage slaw, veggie pakoras with chicken kebobs) with Lini Mazumdar, and you will walk away full from delicious foods and various cooking techniques. Sleep off your food coma on a deluxe king bed in your spacious guest room with a claw foot tub shower. In the morning, enjoy a hearty breakfast of oatmeal, veggie scramble, artisan sourdough toast, house potatoes and jam, and your choice of Vermont bacon or sausage. Let your inner cook shine and impress your loves ones with your newfound culinary skills. 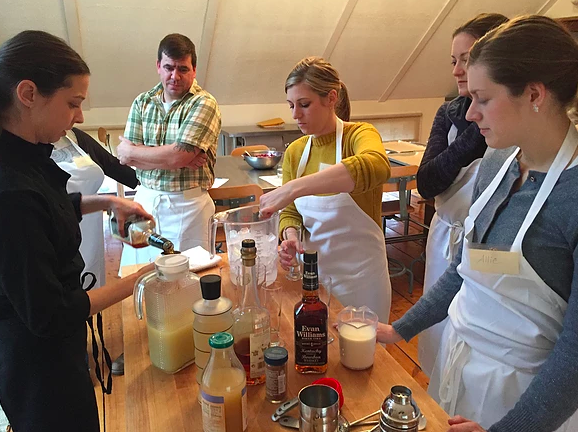 These B&B cooking classes “whisks” guests away and shows them how to add some “zest” to their meals and some much needed “spice” to their taste buds. This entry was posted in Classes, Courses and Workshops, Culinary Escapes, Girlfriends Getaways, Recipes, Uncategorized by BnBFinder. Bookmark the permalink.